Dance Classes: The purpose of this class is to help you learn some of the more common dance styles found in Costa Rica. Learn Meringue, Salsa, Marcado and Cumbia. Cooking Class: Learn how to cook some of the favourite local Costa Rican dishes. Intercambio’s: Meet with locals who are learning English. You will help them practice their English and they will help you learn Spanish! Besides brushing up on your Spanish it is a great way to meet some Ticos. Visits To National Parks: Costa Rica is famous for its beauty. The best place to experience this is to go to one of the country's many national parks. 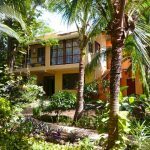 Many of these parks are close to Playa Tamarindo. Deep Sea Fishing: There are a number of charter boats working on the Pacific Coast area. Coastal Spanish can help you find the right charter outfit. Canopy Tours: A canopy tour is one of the more popular things to do in Costa Rica. High up in the rainforest one gets an opportunity to see the unique ecosystem found high up in the trees.